WASHINGTON — The makings of an epic constitutional battle over the executive branch’s power to keep information secret from Congress started to take shape on Friday, as Attorney General William P. Barr began to weigh how much to disclose about the findings of the special counsel, Robert S. Mueller III. As Mr. Barr officially informed Congress that Mr. Mueller had handed in his long-awaited report about the Trump-Russia investigation to the Justice Department, Democrats on Capitol Hill immediately reiterated their demands to see the entire document — and more. Democrats have made clear they are also determined to gain access to the Mueller team’s supporting evidence and other investigative files, virtually guaranteeing a fight. “Now that Special Counsel Mueller has submitted his report to the attorney general, it is imperative for Mr. Barr to make the full report public and provide its underlying documentation and findings to Congress,” Speaker Nancy Pelosi and Senator Chuck Schumer, the Democratic leader, said in a joint statement. In a letter to Congress on Friday, Mr. Barr said he might release Mr. Mueller’s principal conclusions as soon as this weekend. He is expected to take a longer time to review the broader report for information that is classified, subject to grand-jury secrecy rules or relevant to any open investigation before deciding what to show to Congress. 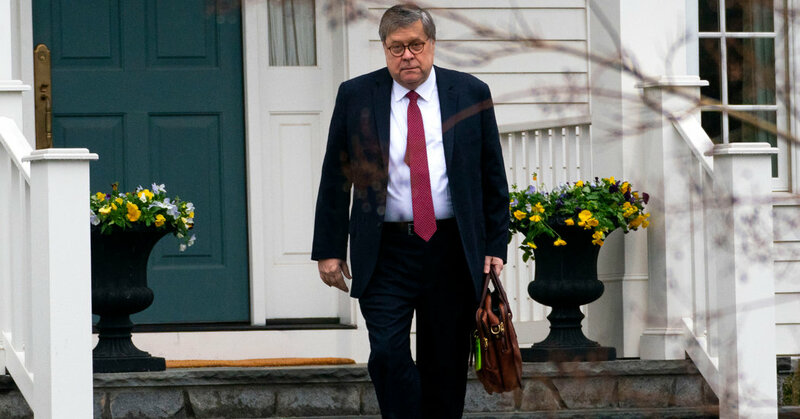 Mr. Barr also plans to consult with the White House about any confidential internal information, including private conversations of the president, that is potentially subject to executive privilege. Decisions about what to make public will be even more complicated. The House voted unanimously this month for a nonbinding resolution demanding that lawmakers be permitted to read the entire report and that the public be allowed to see as much as the law allows — even though the Justice Department’s special counsel regulations, written by the Clinton administration after Ken Starr’s investigation into the Whitewater and Monica Lewinsky scandals, do not call for that. They also do not prohibit it. Such a fight would play out politically — with accusations by Democrats of a cover-up and by Republicans of legislative overreach — and legally. Democrats would begin with a House subpoena to Mr. Barr, followed by a vote to hold him in contempt over whatever he does not turn over. The House would then file a lawsuit to enforce its subpoena, asking a court to order Mr. Barr to comply with it. That would require the judge to decide whether Mr. Barr had a lawful basis to disregard the subpoena, including whether any invocation of executive privilege by Mr. Trump was legitimate. Anticipating a lengthy fight, Democrats have already moved to gain access another way to some of the information Mr. Mueller gathered: by asking his witnesses who provided materials to him to give them copies of the same records. Swiftly recreating as much of Mr. Mueller’s files as possible was a key strategy behind letters the House Judiciary Committee chairman, Representative Jerrold Nadler, Democrat of New York, sent to 81 people and organizations this month asking for records. The committee so far has received tens of thousands of pages, but the most sensitive information gathered is available only from Mr. Mueller, leaving plenty to fight over. The top Democrats on six House committees issued a joint statement on Friday night calling on the Justice Department not only to release to the public “the entire report,” but also to give their panels “the underlying evidence uncovered during the course of the special counsel’s investigation” upon request. One potential obstacle will be information that is classified, like material that could reveal a secret source of intelligence about the Russian government. The executive branch traditionally limits highly sensitive information to the intelligence committees or even just the top “Gang of Eight” congressional leaders. Another potential hurdle will be information that Mr. Mueller used a grand jury to gather, such as records and testimony he obtained by subpoena. Federal rules of criminal procedure generally bar disclosure of such materials to outsiders — a limit that, on its face, makes no exception for Congress. Still, a judge could issue an order permitting grand jury information to be shared with Congress, as happened in 1974 during the Watergate scandal. A key question would be whether the Trump administration consents to such a request — as the Nixon administration did — or fights it. Notably, for the part of the investigation that focused on whether Mr. Trump obstructed justice, Mr. Mueller’s team gathered information from witnesses through voluntary F.B.I. interviews that are not shielded by grand-jury secrecy rules, according to lawyers familiar with the matter. A more sweeping obstacle will be any information that Mr. Trump seeks to shield by invoking executive privilege — the power to keep secret information whose disclosure could inhibit the executive branch’s ability to carry out its constitutional functions, like chilling the candor of internal deliberations. There are two categories of information that may be protected by executive privilege: communications involving the president — which would most likely apply only to events after Mr. Trump was sworn in — and internal agency deliberations, including investigative files covering the campaign and transition. But the scope and limits of executive privilege are murky. Courts have held that Congress also has a right to gain access to information it needs to carry out its own constitutional functions of conducting oversight and enacting legislation. Because these rival imperatives overlap, courts have encouraged presidents and lawmakers to resolve disputes by negotiating compromises to accommodate both branches’ needs, like letting lawmakers read certain documents but not take copies of them. As a result, few disputes have resulted in definitive judicial rulings that could serve as guideposts if both sides dig in over the Mueller files. In recent years, the line the Justice Department has tried to hold has eroded because Republicans repeatedly demanded and gained access to internal law-enforcement information generated during the Obama era, including going to court to obtain department emails about how to respond to congressional inquiries about the gun trafficking investigation called Fast and Furious. Republican lawmakers also obtained information about the Hillary Clinton email server investigation, including a record of her F.B.I. interview and — with Mr. Trump’s help — information about the early stages of the Trump-Russia investigation, including an intelligence wiretap order targeting Carter Page, a former adviser to the Trump campaign with links to Russia.